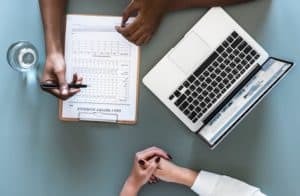 You will recall in part 1 of this series that we spoke about fetal development, gut/nervous system connection and how these affect digestion. In part 2, I want to expand on this and focus on a common pattern that I have seen countless times in practice: stress, perception and digestion. 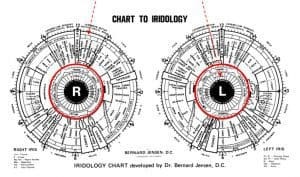 Let’s use Iridology to illustrate and then I’ll explain. The way to interpret this: on the left hand side I have pointed to the area’s labelled ‘ego pressure’, ‘pituitary gland’ and then radiating further inward toward the transverse colon and stomach. On the right hand side I have tried to illustrate what a lesion (dark, deep ‘furrow’) would look like in the eye itself. The lesion usually extends from the bowel outward through the pituitary and into the ego pressure center in the brain. It can also sometimes start from as far in as the pupil and extend to the outer portion of the Iris. The red ring is the nervous system (technically autonomic nerve wreath) – you can see how the bowel is connected to pituitary and brain via the nervous system. In Iridology terms, what happens in the specific bowel area affects the adjacent organs and tissues outside the autonomic nerve wreath. Make sense? The question becomes one of those chicken and egg situations. Where did all of this start? Let’s start with the nervous system since it is the bridge between much of what we are talking about. I’ll try to keep this complex system as simple as possible. 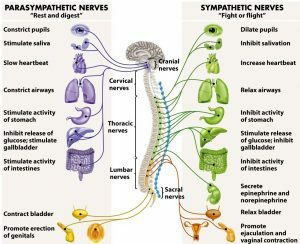 The nervous system is divided into two parts: the Central Nervous System (CNS) and the Peripheral Nervous System (PNS). The PNS is further divided into a few different branches as we go down the flow chart below. 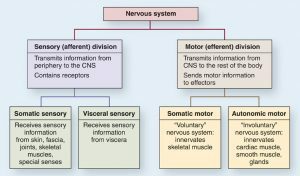 The somatic nervous system (SNS) conducts messages between the various parts of the body and the skeletal muscles, and the autonomic nervous system (ANS) conducts messages to and from the vital organs, glands, blood vessels and tissues. The ANS can then further be divided into 2 parts: the Sympathetic and Parasympathetic nervous systems (more on this in just a second). There are many kinds of nerve functions. Sensory neurons transmit information to the brain such as sight, smell, touch, sound, taste, pressure, temperature, movement, balance and other less familiar sensations. Somatic neurons carry impulses between the brain and skeletal muscles, primarily in response to sensory signals. Autonomic nerves keep the organs, glands and other specialized tissues functioning, generally below the level of conscious awareness. They are, however, constantly affected by our consciousness of what happens to us and around us. This is the crux of the matter when it comes to perception and digestion. The way that we perceive our lives and the world around us engages the nervous system physiologically. Through our brain centre (Hypothalamus, Pituitary), sensory signals are sent throughout the body with very powerful physical effects. It is interesting that these glands in our brain sit in the brow chakra, the seat of perception. This is precisely why I consistently see lesions running through the pituitary-nervous system-bowel: they are all connected in a very profound way. The fight or flight response is a built-in survival mechanism. It is usually reserved for immediate danger such as moving out of the way of a speeding car or running away from a vicious dog. Under these circumstances the body shunts all blood and nutrients toward the muscles, arms and legs; and away from the digestive system. It also sends a message to the adrenal glands to pump out the hormones adrenaline, noradrenalin and glucocorticoid hormones. This makes sense since we want as much energy as possible in order to fight or run (flight) as fast as we can. Remember this response is reserved for immediate danger. So what happens when we perceive a high-stress lifestyle as immediate danger? Well instead of logically thinking about things and responding accordingly – known as the ‘rest and digest’ response – we again initiate the fight or flight response. Themes that I have found to consistently affect this area from an emotional standpoint are: being too hard on ourselves and driving ourselves to exhaustion (ego pressure, see the Iridology chart above), stretching ourselves too thin and over-committing (unable to say ‘no’ and fear of rejection), fear in general (of failure, ‘not being good enough’, ‘the world is a dangerous place’) and perfectionist standards. As we sub-consciously feed ourselves these emotions on a daily basis, the adrenal glands and nervous system become severely depleted. 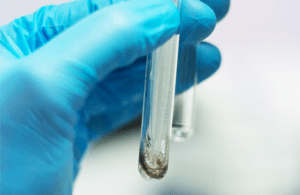 Once the adrenals become depleted a wide variety of seemingly unrelated symptoms manifest. As you can see below, much of this has to do with the digestive system. It is clear then that what comes into the nervous system by way of the senses and by way of our emotional responses is just as important as the balance of nutrients we take into the body. Just as there are healthy foods and junk foods, there are also healthy experiences and junk experiences. It has been said that it is not just what we eat that counts but what we can digest, assimilate and absorb. Similarly, it is not always what we experience that counts, but what we can assimilate and digest in our emotions and intellect. Because each of us is a unique individual, similar experiences would have different effects on each of us and our nervous systems. While one person might thrive in a fast-paced work environment another might have a nervous breakdown. Similarly while living a peaceful life on the proverbial mountain top might be relaxing for one, for another it might not be enough stimulation. 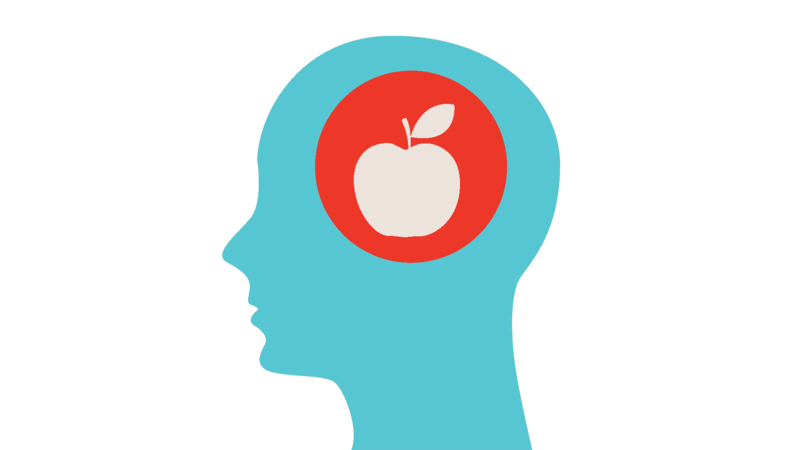 The point here is that we must realize that what we feed our nervous system by way of our experiences, lifestyles and emotional responses directly affects the whole body. Nervous tension from anxiety, worry, unforgiveness, hate or anger can affect the glands, digestion, elimination, circulation and more. 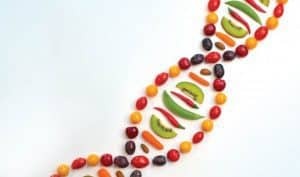 While there are many dietary, supplemental and mechanical ways that can be used as a remedy, it is important to change the thinking that brought us to that point in the first place. In part 3 of this series, I will be offering some tools and tips on how to overcome some of these negative perceptions. It is often not easy as it sometimes requires serious lifestyle changes and life choices; more on this next time. Hope you enjoyed and feel free to share.